Local control of individual AC units is convenient, but management’s responsibility for health, safety, and cost control means oversight and override capability is also very desirable. Airtopia Central provides that capability. It can provide Operations personnel with realtime nonintrusive monitoring of temperature, operational status and energy consumption via a web based portal or smartphone App. The data is logged and collated to provide a full ongoing history for every measure-point in your premises. From your Airtopia log-in you can see all the current settings for each site, including room temperature and power usage stretching back to the installation date. And you can adjust and over-ride every function of the factory remote. 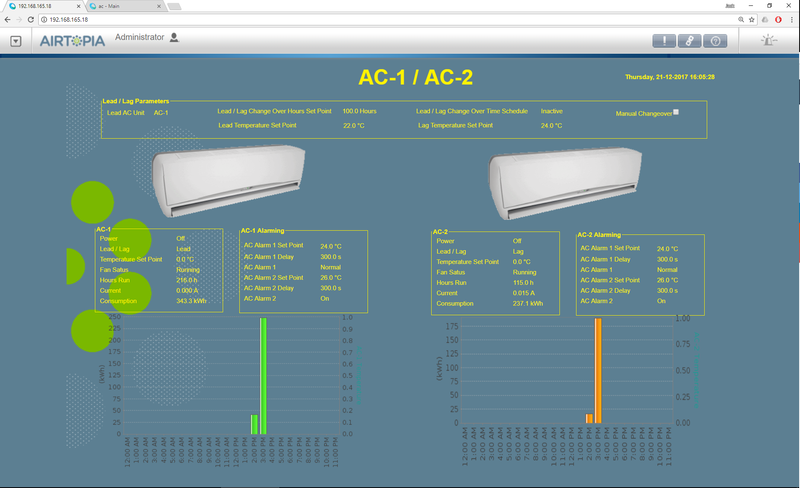 Airtopia Central allows authorised operators to customise settings, background programming, operational scheduling, and limits to be managed for individual AC units from the management desk. Key measures are displayed in real time and historical data is available for download for analysis and planning. Airtopia software is easy to use and all the necessary training for operations staff can be provided. Because no two sites are the same, the Airtopia investment will be different for every one, so the payback will vary too. From experience, reductions in energy costs between 20% and 50% are commonly achievable. Building management or home automation system? Airtopia can interface directly with all the common systems. Check out our Compatibility List.